To be used in conjunction with our Senator, Phantom, Marathon and Husky Sliding systems, the Easyclose Door closer use pneumatic technology to automatically keep a door closed. Catering for doors weighing up to 100kg, the Easyclose Door Closer has a power force start of 1.5kgf and a power force extended of 4.1kgf. 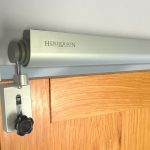 Suitable for both left and right hand openings, the system can be used with doors which have a maximum width of 1270mm.